The dry land wheat farmers in the Western Cape have had a very dry year with major moisture stress damage to the crops while the summer drought continues in the summer crop production areas. The rainfall required on a growing crop or to boost soil moisture for the next crop is totally out of the hands of these farmers. They can only react to the prevailing climatic conditions with good or bad rainfall seasons being unpredictable. Irrigated wheat farmers on national water schemes or with their own source of dependable stored water on the other hand are able to control and manage all the important aspects or production factors required to maximise yields and thus, net income. The above production indicates an average of 3,39 tons of wheat per hectare. These estimates include the areas planted to irrigated wheat which would increase the average shown. Dry land wheat yields in general average about 2,5 t/ha while irrigated wheat yields average around 5 t/ha. The total area planted to wheat in the Free State has increased from 69,500 hectares to about 80,000 hectares or a 15% increase on the previous season. This increase suggests that the wheat price has increased to a level which has encouraged an increase in the area planted to wheat. The area taken up nationally under irrigated wheat, of about 133,000 hectares, makes up about 21% of the total area but contributes 41% to the total production realised. As South Africa is a net importer of wheat it is important that we maximise the yields achieved per hectare of wheat under irrigation to save foreign exchange. The Safex future prices for bread milling wheat range from R4 163 for October 2015 to R4 371 for July 2016. Please refer to the Safex agriculture commodities site for the detailed information. The silo differentials are also shown in detail for each registered silo in South Africa including the rates prevailing for the Western Cape. It is important to subtract the differential rate shown from the Safex price to arrive at an estimate for the “in pocket” price for the wheat produced on your farm. The values range from R85,00 per ton for the Battery silo to R550,00 for Malmesbury and reflect the transport costs incurred to critical silo reference points. This implies a net farmer price realised from R4 078,00 per ton to R3 613,00. The actual price realised will make a large difference to your net margin per hectare which should be evaluated by doing a very detailed gross margin analysis for your irrigated wheat crop. When examining the factors that contribute to the maximum yields within an irrigated wheat enterprise each aspect must be analysed from past physical and financial performance records of previous wheat crops so that any shortcomings be identified and corrected. Some of the main factors to consider in detail are considered below, keeping in mind the maxim that an intensive production system requires intensive management. In a study completed by the personnel of the ARC at Bethlehem grain yield, hectolitre mass, protein content and falling number of the cultivars planted in the cooler central irrigation areas in 2014 were measured and compared in the ongoing cultivar evaluation programme. The cultivars measured included Buffels, Duzi, Krokodil, and several PAN cultivars, Sabie and several SST’s. The average yield measured was 8,36 t/ha with a range of 7,27 to 9,01 t/ha. Irrigation farmers in the Orania and Jacobsdal areas have realised yields of over 10,00 t/ha from season to season over the last few years. In some cases wheat was doubled cropped after maize or planted after a crop of beans or other summer crop. Burning of the previous maize crop took place in some cases and a fallow period after summer crops occurred before the wheat crop. The results however prove that even with intensive double cropping a 10 ton yield is achievable either after maize or a legume crop in the rotation. These farmers have improved yields from 6,5 t/ha over many years to the high yields being currently achieved. If your yields are in the lower band then a critical examination of each production aspect should indicate where the first steps can be taken to boost yields. If we consider an improvement from 8,36 tons to a yield of 10 tons, the extra income at a net wheat price of R3,800 would be R 6,232 per hectare. On a 60 hectare centre pivot an additional R373,920 would be generated. A 1,64 ton improvement over your current production average at whatever this might be will generate a significant income. The proven genetic production potential can be achieved by critically examining your soil profile and the soil water relationships under your control such as soil depth, soil texture, soil structure, presence of a compacted upper layer or deeper restrictive layer such as shale or calcite deposits. 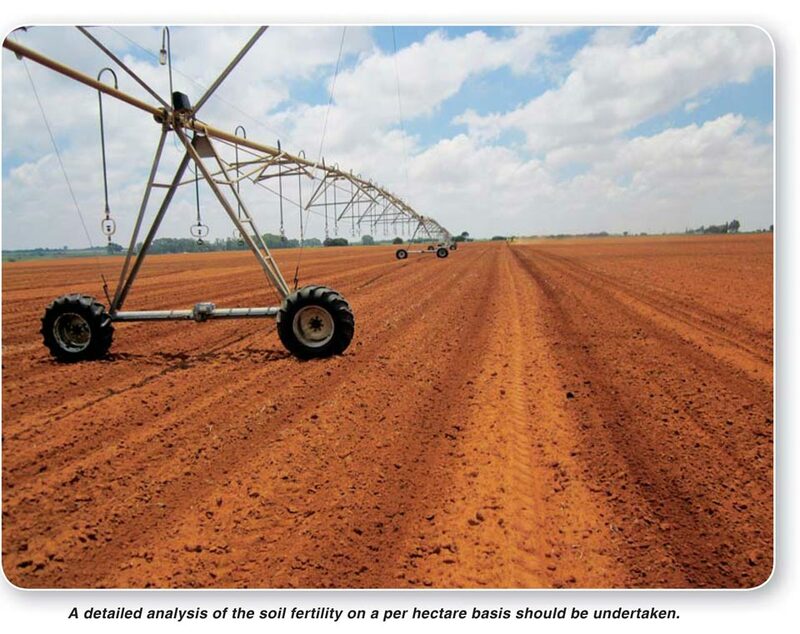 Each land under irrigation should be plotted on a per hectare basis with the above variables in mind so that lower potential areas within a 60 hectare pivot can be improved or eliminated. Compaction can be a major cause of lower yields and must be eliminated. 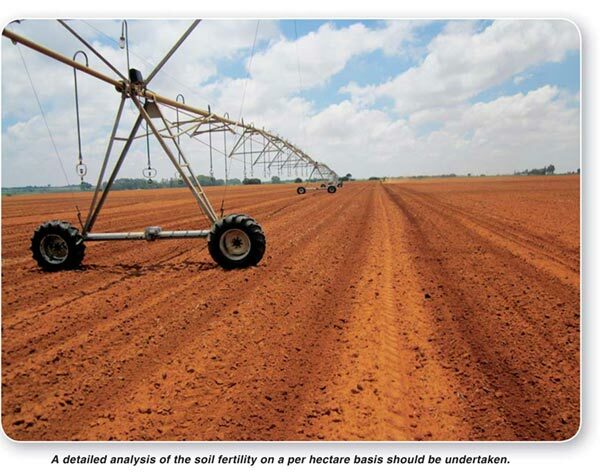 A detailed analysis of the soil fertility on a per hectare basis should be undertaken with samples taken in the top 150 cm to 160 cm and the layer below this. Severe soil acidity in the different sectors can be measured and then corrected. To achieve a 10 ton yield the pH, phosphate status and balance of magnesium to calcium to potassium ratios must be at optimum recommendations. The correct type and amount of lime must be applied on a per hectare basis. The best cultivars for your area should be planted correctly with accurate seeding rates and seed spacing. Use the best planters available for precision placement and seed spacing. Adequate phosphate levels must exist to reach high yield levels and a minimum of 20 kg - 25 kg of nitrogen per ton of yield should be applied. A 10 ton yield would require a budget of between 200 kg and 250 kg of total nitrogen applied in four or five applications through the centre pivot during the growing season. Your centre pivot or irrigation system must be very well maintained and tested for even distribution of water through the irrigable area. Droplet size should be tested and assessed especially if you experience wind in your area. Pivots should be scheduled to run at the correct times to take advantage of the lowest electricity tariffs prevailing. 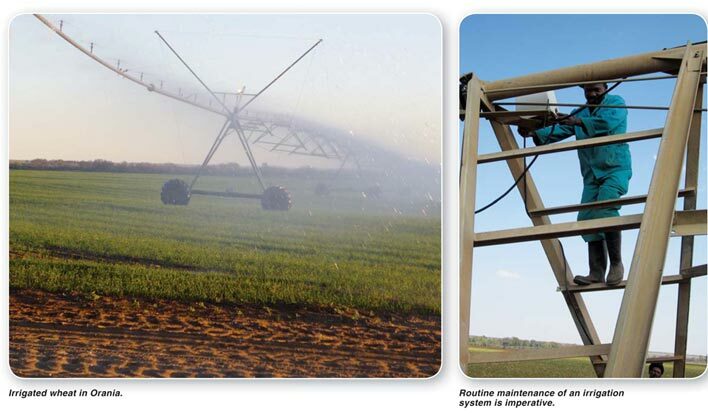 It is wise to install the latest electronic monitoring systems that can give you constant live information on the moisture levels at various points in the soil profile so that under or over watering does not take place. A high wheat yield can only be achieved if the crop receives enough moisture before and after flowering. In most cases, if you start with a soil profile at planting below field capacity you will never catch up during the relatively short production cycle. Modern combines equipped with GPS monitoring systems should be used so that the differences in yields in various sectors can be measured and analysed. The yield indicators can be used to look at soil profiles, soil fertility and possible variations in the water applied so that corrective action can be taken to further improve yield in the next planting. Every possible facet of your management practices for improved irrigated wheat yields should be critically examined so that the expected targets can be realised.